As 2017 came to a close, I began to debate which King book to start 2018 off with. As I stared at my bookshelf, none really jumped out at me as one that I just had to read. I began to accept that I would just pick one and that would be my choice. Then I came up with the idea of letting other people decide which King book would be my first read of the new year. I turned to Twitter and put up a poll for my followers to vote on. I chose for books at random—Rose Madder, Sleeping Beauties, Needful Things and The Colorado Kid—and my fate in the hands of fellow readers. After the initial posting, I stepped away from Twitter and when I returned a half hour later, curious to see what had taken the lead, one book had stood out above the rest. That book was Needful Things. On top of the early commanding lead, I received multiple comments on the tweet from people, asking me how had I not read it yet, or stating that it was one of their favorite—if not their outright favorite—novels by King. My interest was immediately piqued, and Needful Things was instantly on my radar. Was it possible that I hadn’t yet read every epic piece of literature that Stephen King had to offer? It was seemingly possible, and throughout the duration of the poll being open to vote it seemed as if I was going to soon find out. 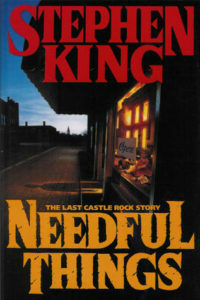 By the time the poll closed on Twitter, Needful Things had a strong lead over the other titles with forty-three percent of the votes. Nearly five-hundred people had spoke up, and had chosen it as my next King read. Well written, I love Stephen King my all time best author. I have read every one of his books, his characters are strong and the storylines are brilliant, As well as reading the book I saw the film, and the film was exactly like the book.